Have you ever heard of Scouse the Mouse? It’s a children’s album from the 1970s. Ringo Starr is Scouse. He emigrates from Liverpool to the United States. It’s super-cute – check it out at this link. The other cool thing about it is that is was written by Donald Pleasence- he was a great actor who played in The Great Escape, and the villain in the James Bond flick, You Only Live Twice. He was best known (to me anyway) as the doctor in the Halloween movies. He was also in the RAF in WWII (after initially being a conscientious objector) and was shot down and captured. What an interesting life he led. He’s probably worth a FF all on his own, right? 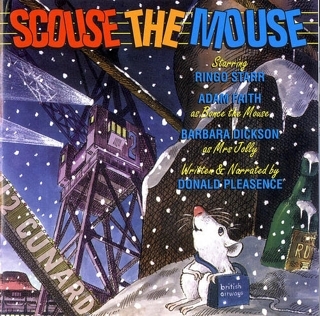 I never heard of Scouse the Mouse. For some reason I couldn’t get sound from the link. Some good names on it. Loved it, got the sound. I had a little bit of computer yuckies yesterday so must have reset the sound. Cool. Glad you could hear it. Fun. I always liked Donald Pleasance as well. I don’t know this! CUTE! I am surprised that my nieces weren’t right on this.Because of them,I knew almost every other kid thing in the 70’s. Love the beat!